“All who love Me will do what I say. My Father will love them, and we will come and make our home with each of them. Anyone who doesn’t love Me will not obey Me.” (John 14:23-24, NLT) The last section on our 3-day tour of Christ’s home (Your heart) begins with the “Bedroom.” The bedroom in the home of a Christian husband and wife is to serve as the room where the deepest levels of intimacy is expressed just as God has created it to be in His design of a covenant marriage. Similarly, this spiritual room in our hearts is to be the most personal room for it is here that we develop the deepest intimacy with Christ. The Biblical blueprint for this room’s purpose reads: “I have perfumed my bed with myrrh, aloes and cinnamon. Come, let's drink deep of love till morning; let's enjoy ourselves with love.” (Proverbs 7:17-18) God invites us to spend intimate time with Him … He already knows everything about us (remember, He created us! ), but we need to spend intimate time getting to know Him as our Creator God! Like in the homes of Christian families, the divine purpose of this room truly needs to be guarded – this is not to be like others rooms in our home – this is to be a room that is sanctified (set apart) for the special purpose resting and developing our spiritual union (relationship) with Christ. Next we move with the Lord down the hallway of our hearts to find the “Hall Closet.” This is the room where we stuff (hide) much of our junk when company comes / drops by “unannounced” sometimes. The Biblical blueprint for this room’s purpose reads: “For (God) will bring our darkest secrets to light and will reveal our private motives.” (1 Corinthians 4:5) Often times, this room is the smallest room in the home, but it can become so filled with “stuff / junk” that we have try to find other places like the “Basement” for extra storage. God has graciously given us a beautiful way to clean out the “unneeded stuff / junk” (i.e. SIN) that so easily accumulates in the “hall closet(s) / basements” of our heart – we find it in 1 John 1:9 which reads, “If we confess our sins, He is faithful and just and will forgive us our sins and purify us from all unrighteousness.” This takes a daily commitment to keeping His home (Our Hearts) clean – a commitment we need to persevere (to persist) to obediently do just as Psalms 51:10 reminds us, “Create in me a clean heart, O God, and renew a right, persevering, and steadfast spirit within me.” (Amplified Bible) Near the hall closet is the “Bathroom.” Similar to the bathrooms in our home, this room should be ‘daily’ used to get rid of the ‘waste’ful things of this world that tend to creep into our hearts / lives over time. The Biblical blueprint for this room’s purpose reads: “And do not bring sorrow to God’s Holy Spirit by the way you live…Get rid of all bitterness, rage, anger, harsh words, and slander, as well as all types of evil behavior.” (Ephesians 4:30-31, NLT) The last room of our tour is a room where we often store special memories of our past – the “Attic.” It is here that every once in awhile we may break away from the ‘routines’ of our busy culture/world and just sit and reflect upon special memories of yesteryear – family, friends, life events and how our faith in Christ has sustained us throughout our life journey. The Biblical blueprint for this room’s purpose reads: “Good friend, don't forget all I've taught you; take to heart my commands. They'll help you live a long, long time, a long life lived full and well.” (Proverbs 3:1, The Message) So that completes our special 3-day tour of Christ’s home – Your heart … the address where the Holy Word tells us where Christ lives. But know this – He only moves in when we invite Him too – He never forces His way in or demands to come in. In fact, the Word says that He is the Guest who “stand(s) at the door (of our hearts) and knocks. If anyone hears My voice and opens the door, I will come in and eat (commune / live) with Him, and He with Me.” (Revelation 3:20) The Apostle Paul shares that when YOU open the door to receive Him in, then “Christ will make His home in your hearts as you trust in Him (by faith).” (Ephesians 3:17, NLT) The Amplified Bible states this passage this way: “Christ through your faith [actually] dwells (settles down, moves in, abides, make His permanent home) in your hearts!” What a beautiful word picture of a spiritual truth – as genuine Christians who have received Christ as Savior and Lord, our hearts are now Christ’s home! 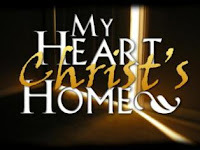 Take a moment and look around the home of your heart … have you sincerely invited Christ to live in your HOME (your HEART)? – “To as many as did receive and welcome Him (into their hearts), He gave the authority (power, privilege, right) to become the children of God!” (John 1:12, Amplified Bible) …Selah! Today's Spirit-led video is by CCM artists Hillsong and can be viewed by clicking on the on the same song title as Pts 1 & 2 of this mini-series, "My heart, Your home" - G3 for His gift of ministry thru Christian music! "Cold Love or Hot Hearts?"